Astronomers studying distant galaxies powered by monster black holes have uncovered an unexpected link between two very different wavelengths of the light they emit, the mid-infrared and gamma rays. The discovery, which was accomplished by comparing data from NASA's Wide-field Infrared Survey Explorer (WISE) and Fermi Gamma-ray Space Telescope, has enabled the researchers to uncover dozens of new blazar candidates. Francesco Massaro at the University of Turin in Italy and Raffaele D'Abrusco at the Harvard-Smithsonian Center for Astrophysics in Cambridge, Massachusetts, show for the first time that the mid-infrared colors of blazars in WISE data correlate to an equivalent measurement of their gamma-ray output. "This connection links two vastly different forms of light over an energy range spanning a factor of 10 billion," said Massaro. "Ultimately, it will help us decipher how supermassive black holes in these galaxies manage to convert the matter around them into vast amounts of energy." 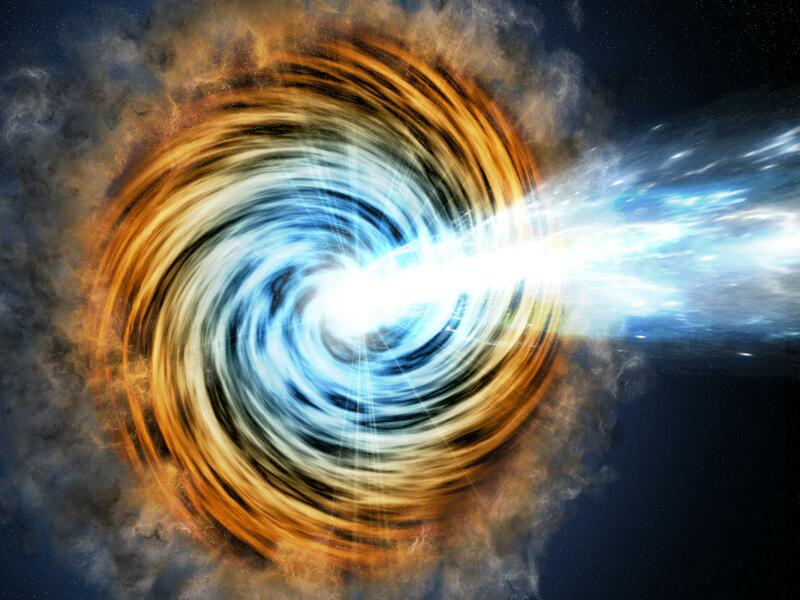 Blazars constitute more than half of the discrete gamma-ray sources seen by Fermi's Large Area Telescope (LAT). At the heart of a blazar lies a supersized black hole with millions of times the sun's mass surrounded by a disk of hot gas and dust. As material in the disk falls toward the black hole, some of it forms dual jets that blast subatomic particles straight out of the disk in opposite directions at nearly the speed of light. A blazar appears bright to Fermi for two reasons. Its jets produce many gamma rays, the highest-energy form of light, and we happen to be viewing the galaxy face on, which means one of its jets is pointing in our direction. From January to August 2010, NASA's WISE mapped the entire sky in four infrared wavelengths, cataloging more than half a billion sources. In 2011, Massaro, D'Abrusco and their colleagues began using WISE data to investigate Fermi blazars. "WISE made it possible to explore the mid-infrared colors of known gamma-ray blazars," said D'Abrusco. "We found that when we plotted Fermi blazars by their WISE colors in a particular way, they occupied a distinctly different part of the plot than other extragalactic gamma-ray sources." The scientists detail new aspects of the infrared/gamma-ray connection in a paper published in The Astrophysical Journal on Aug. 9. They say the electrons, protons and other particles accelerated in blazar jets leave a specific "fingerprint" in the infrared light they emit. This same pattern is also clearly evident in their gamma rays. The relationship effectively connects the dots for blazars across an enormous swath of the electromagnetic spectrum. About a thousand Fermi sources remain unassociated with known objects at any other wavelength. Astronomers suspect many of these are blazars, but there isn't enough information to classify them. 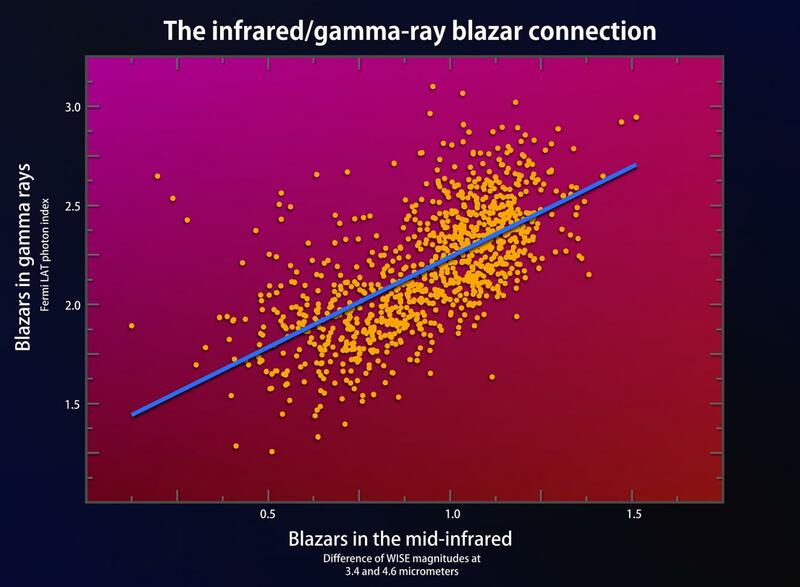 The infrared/gamma-ray connection led the authors to search for new blazar candidates among WISE infrared sources located within the positional uncertainties of Fermi's unidentified gamma-ray objects. When the researchers applied this relationship to Fermi's unknown sources, they quickly found 130 potential blazars. Efforts are now under way to confirm the nature of these objects through follow-up studies and to search for additional candidates using the WISE connection. "About a third of the gamma-ray objects seen by Fermi remained unknown in the most recent catalog, and this result represents an important advance in understanding their natures," said David Thompson, a Fermi deputy project scientist at NASA's Goddard Space Flight Center in Greenbelt, Maryland.